Whether it is a drinks party, a Christmas coffee morning or a gift for a school teacher, it is always special to give something handmade. 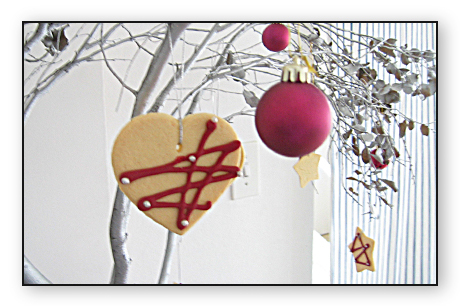 Fill a Kilner jar with the layered cookie mix ingredients then attach a festive-shaped biscuit cutter and a card with the recipe for gingerbread cookies written out in your best handwriting. Combine two-thirds of the flour with the baking powder, then tip this mixture into the jar. Shake gently to level out. Spoon in the brown sugar and roughly level out. Blend together the remaining amount of flour with the spices and carefully pour this on top of the layer of sugar. 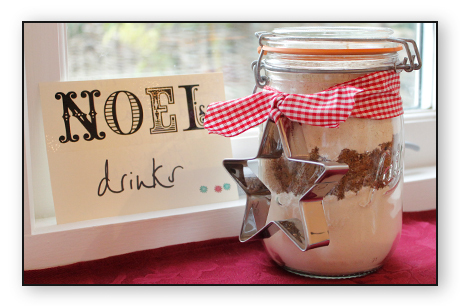 Seal the jar securely and attach the cutter and the recipe card with brightly coloured twine or ribbon. • Melt the butter in a large pan with the syrup. • Add the egg, then stir in the cookie mix to form a stiff dough. • Divide into two, flatten into discs and wrap in clingfilm. Chill for 20 minutes. • Heat oven to 180°C. • Roll out dough to 3mm thick, stamp out shapes and put on greased baking sheets. • Make holes in the top to thread with cotton later. • Bake for 10 – 12 minutes until golden. • Cool on a wire rack; dust with icing sugar. Recipe originally from Country Living Magazine December 2010. 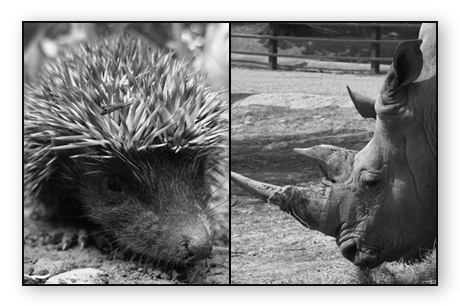 The Parenting Course – Hedgehog or Rhino? All of us and that includes our children can be divided into hedgehogs or rhinos. How do you react to anger? Do you go on the attack and express your feelings aggressively or do you protect yourself by burying your feelings and become introverted? It is helpful to work out how you react to anger but also to know whether your child is a rhino or hedgehog so that you can help them to express their frustrations appropriately and to manage their anger. It is not acceptable to go around kicking furniture and hurling abuse at younger siblings but it is equally unhealthy to skulk in a corner internalising hurt feelings. And our family…? We are a herd of five rhinos and when the rubber hits the road, things can really ‘kick off’ in our household! But Zeb and I recognise this and continually aim to control our own anger and teach the children to do likewise – a task that takes about 18 years. It is also helpful to model how to resolve conflict and for children to see the adults making friends and saying sorry to each other and also to our children if we have got it wrong. If you want to know more about The Parenting Course, click on this link to read my initial post about the course. Here is a link to the Holy Trinity Brompton website which has a video about the course www.relationshipcentral.org. 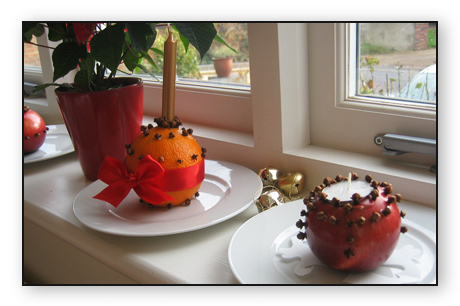 Christingle oranges are rich in symbolism and also look very beautiful. You can refer to this link for more information about their symbolism. Push a small candle into an orange and tie a red bow around the middle. Place a few soft sweets onto four toothpicks and position them around the candle. In the photograph, we didn’t add sweets but decorated the orange with cloves. Tealight apples smell superb as the cloves warm up from the candle when lit. Press a tealight into the top of the fruit to measure the circumference then use a spoon to remove some of the flesh so that the tealight will fit into the apple. Press cloves into the space between the tealight and the apple and continue to decorate the apple with cloves until time or patience runs out. Top tips: It may be necessary to remove a thin slice off the apple and orange to form a flat base. If you struggle to push cloves into the fruit, use a toothpick to first pierce a hole. Two ideas that work well with young children are a robin Christmas card and an angel card. 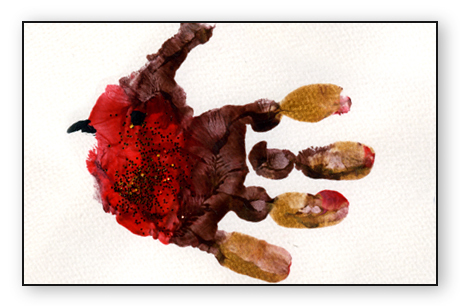 For the robin card, paint your child’s hand brown then add touches of gold and a bright red spot on the palm of his hand. Press his hand on to paper to make a print then add eyes and a beak. 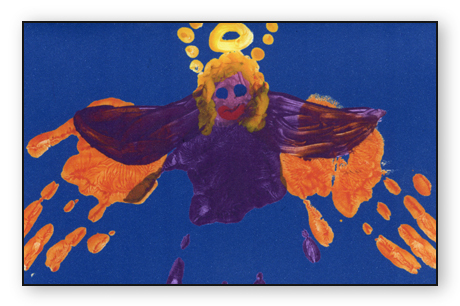 To create an angel, paint his hand in blues and purples and make one handprint with fingers closed. Then paint the hand in a bright yellow or gold and make two handprints with the fingers splayed to create wings. Add facial details and a halo. Both these ideas can be scanned and reduced in size and printed to create a number of cards. With an older child you can brainstorm about Christmas imagery and then give him a good quality black pen and let him design a card using the inspirations you discussed together. This post is part of a Christmas theme of how I as a mum approach this season. As with anything, pick and choose the ideas that appeal to you – I don’t do all of them every year! However I have included all the activities, crafts and traditions that I have done over the past few years. Feel free to share your ideas as comments. This session of The Parenting Course was about listening to our children which is something I am not always good at. I was challenged to pay full attention when my children talk to me and stop cooking or blogging(! ), turn and look at them and listen properly. If I really can’t stop my task then I need to say that I am busy but in 10 minutes I will stop and listen. And then remember to do so. The other important thing I learnt was about reflecting back and repeating back to your child what he has said to you. This will ensure that you are really hearing what they are saying and helps them give their feelings a name. 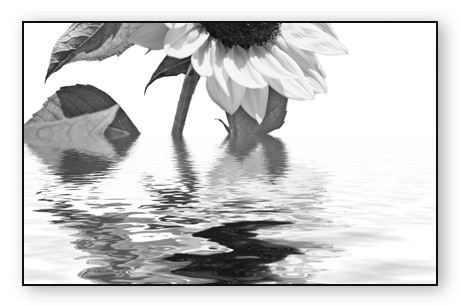 It is so easy to jump in with advice or reassurance while it is far better to empathise with them – advice would be appropriate at a later stage. 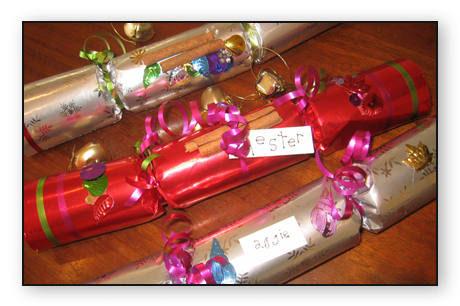 Homemade gifts made by children for parents or grandparents are very special items and here are some ideas and instructions of what we have made in the past. Buy pebbles from a garden centre and give them a base coat of paint then release your child to create a pebble bug. Ladybirds are always popular. Write the date and name on the base with an indelible pen. Varnish the pebble with a clear varnish and add googly eyes if you wish. James’ pebble (above photo) has been sitting on my desk for seven years now. Give an unpainted, unvarnished photo frame a base coat in gold or silver paint and then let your child decorate it. It could be with stickers or with paint depending on the age of your child. 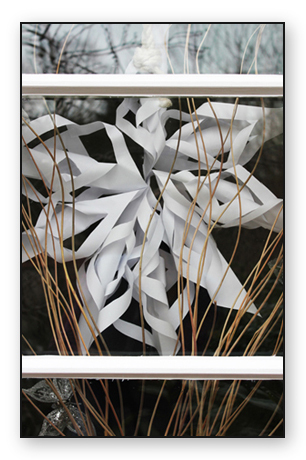 I bought photo frames from Wilkinson a few years ago and you could also try Hobbycraft. I used children’s readymix paint – nothing special. The final touch is to insert a photo of your child into the frame for the proud granny. A variation would be to buy little boxes or candle holders and decorate them. Baker Ross hold a vast supply to keep you going. This ruby-red liqueur looks beautifully rich as you can see in the photo above but if you are too late in the season for collecting sloes, remember it for next year! Full instructions are on my earlier post called ‘A sloe autumn stroll’. 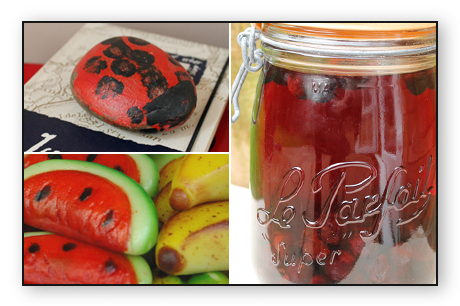 You don’t need much marzipan to make these cute little fruits (see above photo). I used coloured dyes and each child kneaded the marzipan with a few drops of dye until it turned the colour of the dye and then divided it up so we all had a variety of colours. We had so much fun making fruit and then branched out into making sausages, mash and peas! We presented the meals on tiny dolls’ plates as gifts for grandparents. 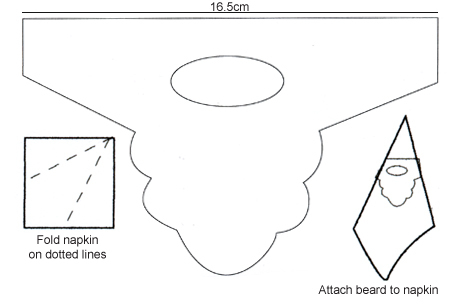 This website link gives you more detailed instructions and images of marzipan fruit. It can be little fraught doing the activity with a young child or a few children at the same time because you are dealing with hot chocolate and boiling water so I would recommend this as a one to one activity. Fill the larger pot with water and allow it to boil on the stove at a low heat. Place the second pot into the water and add a few blocks of chocolate at a time, stirring continuously. Using a double boiler, keeping the heat low and stirring continuously should mean the chocolate won’t burn. Once it is melted, remove from the heat and use a teaspoon to fill the chocolate moulds. Once they are filled, give them a gentle tap and place in the fridge to harden. Try experimenting with marbled chocolate of white and dark swirls or filled chocolates. To make filled chocolate create shells in the chocolate mould, harden them, place the filling into the shell then cover with more melted chocolate and return to the fridge. The chocolates can be packaged in cellophane bags or in homemade origami boxes. This is a great recipe for younger children as no heat is required and makes lovely gifts when placed in cellophane bags or tins. It is from the BBC GoodFood website. Using a wooden spoon, mix together the condensed milk and icing sugar in a large bowl. It will get very stiff. Work the coconut into the mix until it’s well combined – use your hands, if you like. Split the mix into two and knead a very small amount of food colouring into one half. Dust a board with icing sugar, then shape each half into a smooth rectangle and place one on top of the other. Roll with a rolling-pin, re-shaping with your hands every couple of rolls, until you have a rectangle of two-tone coconut ice about 3cm thick. Transfer to a plate or board and leave uncovered for at least 3 hours or ideally overnight to set. Cut into squares with a sharp knife and pack into bags or boxes. These will keep for up to a month at least, if stored in an airtight container. 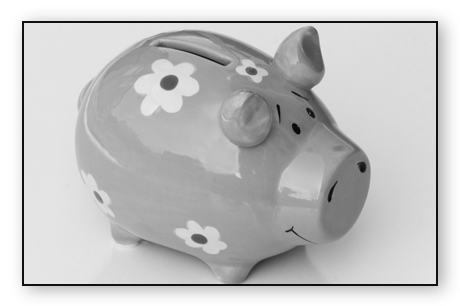 My top tip to instil good saving habits in your children is to stroll into a high street bank together and open a young savers bank account with a small starter fund. So simple and yet so obvious, not an internet account, not in mum’s top drawer but a real bank where they physically take their money and can actually learn how saving works. We did just that two years ago. James, Sophie and Ella each clutching a piggy bank followed me into the bank where the manager greeted us. James tipped open his piggy bank and a shower of small coins fell out all around us. I don’t think the manager had counted coins for many a long year and it took us all back to the grass-roots of saving. Bank accounts were initiated by my grandmother who left her great-grandchildren £50 in her will and requested that the children opened accounts in their own names. I told my children that they needed to save the £50 from great-granny until they were 10 years old but if they added to it with their pocket-money then the bank would give them interest. James’ eyes lit up – extra money just for keeping it in a bank – he was hooked. Another two important suggestions is to give your children pocket-money which is a small amount for them to handle and learn lessons from if they choose to waste it. In our house pocket-money is linked to chores and as you take on more responsibilities, so your money increases. Lastly, don’t buy them everything they want, teach them delayed gratification. If they want it badly enough, they can save up for it. I won’t even lend them money in the shops if they see something that they instantly desire but explain to them that they need to bring their own money and we can return. We all benefit from a cooling-off period!